← Where are your Headsets? Introducing the newest member of the ReviewBeforeFlight TEAM, Mitch Roberts! Introducing Mitchell Roberts, the newest writer here at ReviewBeforeFlight! Mitch & his girlfriend, Audra. This picture is from their flight down the Hudson River, which Mitch wrote about previously for us, the link is further down in this post, check it out! Mitch is currently pursuing his Instrument Rating (IFR) & Commercial Pilot Certificate, and as a result he is working hard to build flight time! I saw this as an opportunity and reached out to Mitch to inquire if he would be interested in doing a regular monthly piece for ReviewBeforeFlight. Mitch is going to be taking over the monthly airport (or close by to an airport) restaurant reviews for our Northeast Pilot readers! Those of you that were reading us back when this was MTElia’s Flying Blog may remember Mitch’s first post, “Expand YOUR flying comfort zone with adventure flights!” I thought a good way for everyone to get to know Mitch would be a quick Q & A! I know that you’ll find his story fascinating too and quickly realize why I wanted to get him involved with our site here! When did you get started flying? Since I was about 6 years old, I was collecting model airplanes from flea markets, toy stores, you name it! As I got older, I could not keep my head from looking at the sky as I heard planes overhead, and on my 14th birthday, I took to the skies for the first time in a Piper Warrior II (N6909A). For years after that, it was a birthday gift to go flying, and as I started high school, things got serious. I soloed a few months after my 18th birthday, and by the time July came around, I was a licensed Private Pilot as a senior in high school. What is your aviation experience up to now? Up to now, I have my Private Pilot License and am very close to finishing my Instrument Rating. I have about 160 hours of total time, and over 50 hours cross country. I love to fly at night, with over 25 hours in night time conditions, and have gone as far north as Bar Harbor, and as far south(west) as the Hudson River. What is your most memorable flight? My most memorable flight has definitely been my flight down the Hudson River Corridor. In January of 2014, my girlfriend Audra and I, took the remarkable flight 1100 feet above the Hudson, from the Tapanzee Bridge and around Lady Liberty. Between the helicopter traffic below, ATC, and the feeling of being below the tallest building (Freedom Tower) in NYC, there was lots going on, but still plenty of time to enjoy the sights on a fantastic flying day. 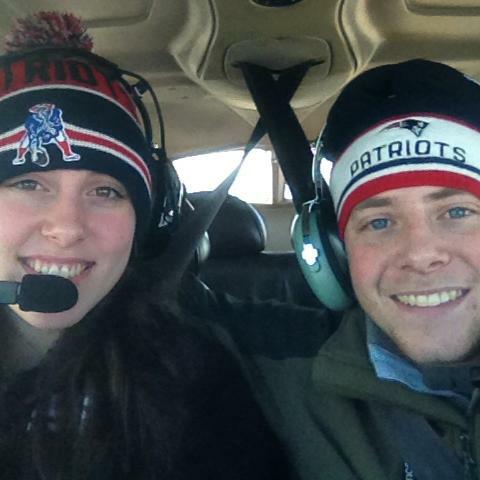 Mitch took his girlfriend Audra along for a flight lesson a few years ago… She had no idea that he had planned a very interesting prom date invitation. Talk about using general aviation in a creative way, huh? 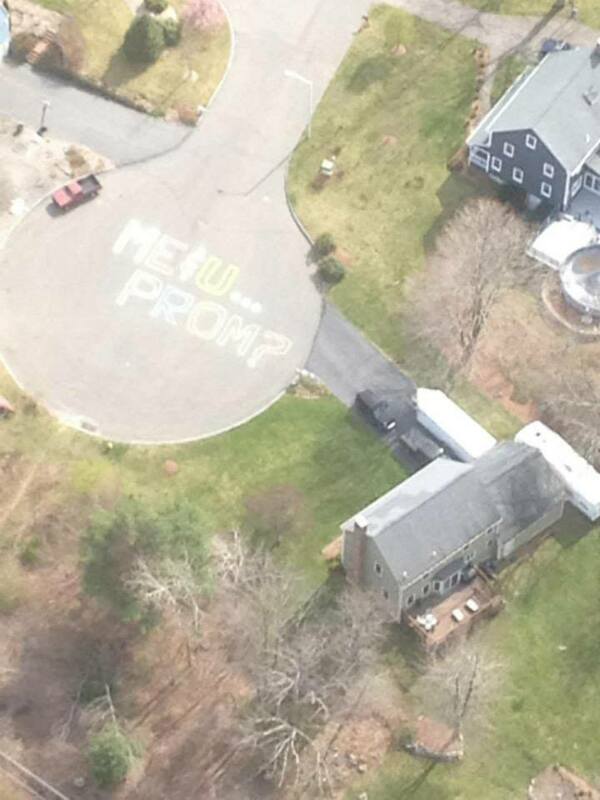 To add to memorable flights, I wanted to “one up” my classmates in high school with asking my girlfriend to prom. I decided to write in my cul-de-sac, in 9 foot letters: “U & Me…PROM?”. With the help of my parents, her parents, and neighbors, we did this the morning of, and I surprised her by taking her flying for the first time, and circling overhead. She said yes, and it made the news to top it off! A very memorable flight for both of us! What is your favorite airport destination to fly to & why? My favorite airport destination to fly to is Block Island up to this point in my flying career. I love the flight from 1B9 to BID, flying over Providence and Jamestown, and approaching the island from the North. The restaurant at the airport is fantastic, and it is a very short cab ride into town! Whether it is Ballard’s Beach club for the day, or in town to shop or eat, there is always something great to do on the island. What was it like when you made your first solo flight? My first solo was the most rewarding day in my Private course. Yes, the checkride was fantastic, but flying the aircraft alone for the first time, and successfully might I add, was an exhilarating feeling. The feeling of control and anxiety together made it confusing, stressful and exciting at the same time. It could not have been a nicer fall day to have a first solo flight. If you had to summarize why someone should earn a pilot’s certificate in 2 sentences, what would you say? I tend to be an “ambassador” for getting a private pilot license at Mansfield to perspective pilots wanting to know more. -The freedom and rewards of having a license cannot compare to anything else that you will ever do; The Vineyard for breakfast or Maine for a lobster dinner! -Skies the limit, literally! The avenues in aviation are uncountable. What are your future aviation plans? I am currently an upcoming junior at Bridgewater State University, majoring in Aviation Science with a concentration in Aviation Management. I am finishing my IFR Rating, and am moving on to Commercial Pilot Certificate soon after. I hope to have my flight instructor certificate (CFI) by my senior year at BSU, and build my hours to become an airline pilot in the hopefully near future. As you can see Mitch is a great example of an aviation enthusiast and someone with a great deal of passion and energy. Moreover, he really enjoys eating, which makes him perfect for the monthly “Flying for Food” reviews! Mitch’s first review is coming up this weekend, and he picked an AWESOME destination/restaurant combo, so stay tuned for his first post as a ReviewBeforeFlight regular!